George Washington (1732-1799) - George Washington is considered the father of his country. He did more to turn the 13 American colonies into a nation than any other person. And that's saying a lot considering there were so many who devoted their lives to that cause. His contribution falls primarily into two categories. 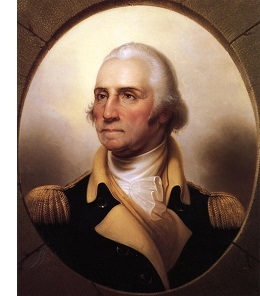 First he served as the Commander-in-Chief during the American Revolution. And it was for this that he prefers to be most remembered. His military career spanned over thirty years beginning as a colonial officer for the British army in the Seven Years' War (or the French and Indian War as it was known in the American theatre). During that time he learned valuable lessons about English war tactics which would serve him well during the Revolution. When friction between England and the colonies intensified, Washington was elected as a delegate to the First Continental Congress. But when war became a distinct possibility, John Adams nominated him to be Commander-in-Chief of the Continental Army, and the Congress approved. George Washington could not be considered one of the greatest military commanders in history. In fact, during the American Revolution, he lost more battles than he won. However, he was a great strategist, and with an inferior military, managed to prevail in the key battles that enabled him to win the war. After suffering a humiliating loss at New York (the first battle after the signing of the Declaration of Independence, and the largest of the war), the Continental Army was already on the brink of defeat. Morale was low and the bulk of the men's enlistments were about to expire. Washington launched a daring gambit on Christmas Evening, 1776. He crossed the Delaware River (famously portrayed in a portrait by Emanuel Leutze) and attacked an outpost of Hessian mercenaries at Trenton. It was a stunning victory for colonists. Washington followed it up with a second victory little more than a week later at Princeton, this time against British forces. Morale within the ranks soared and the victories caused the bulk of the men to re-enlist, as well as attracted new recruits. Saratoga (which Washington did not command) in Autumn 1777 was a pivotal victory because it brought the French into the war on the colonists' side. With the added men and money France brought to the fight, the Continental Army was able to secure victory at the Battle of Yorktown on October 19, 1781. While the French navy managed to block the sea lanes from the Chesapeake Bay (cutting supply lines and preventing retreat), American forces led by Washington, and French forces under the command of Rochambeau, had General Cornwallis and his men pinned against the coast under heavy bombardment. Cornwallis had no choice but to surrender. The Treaty of Paris, which was signed on September 3, 1783, ended the war and George Washington became the undisputed hero of the new United States. He attended the drafting of the US Constitution and was unanimously elected the convention's president (a sign of his popularity). After it was ratified, Washington was the obvious choice to be the first Constitutionally elected President of the United States. He agreed to serve as president more out of a sense of duty than desire. After being unanimously elected twice, Washington decided to step down. Many believe his refusal to run for a third term was his greatest act. He could have been president for life (actually he could have become king had he wanted to), but his longing for private life over power has been compared to that of Cincinnatus of ancient Rome. He even refused the lofty title of "Majesty" for the more modest "Mr. President". At the end of the Revolutionary War, King George III asked his American painter, Benjamin West what Washington planned to do after winning American Independence. West replied, "They say he will return to his farm." The king said in astonishment, "If he does that, he will be the greatest man in the world."